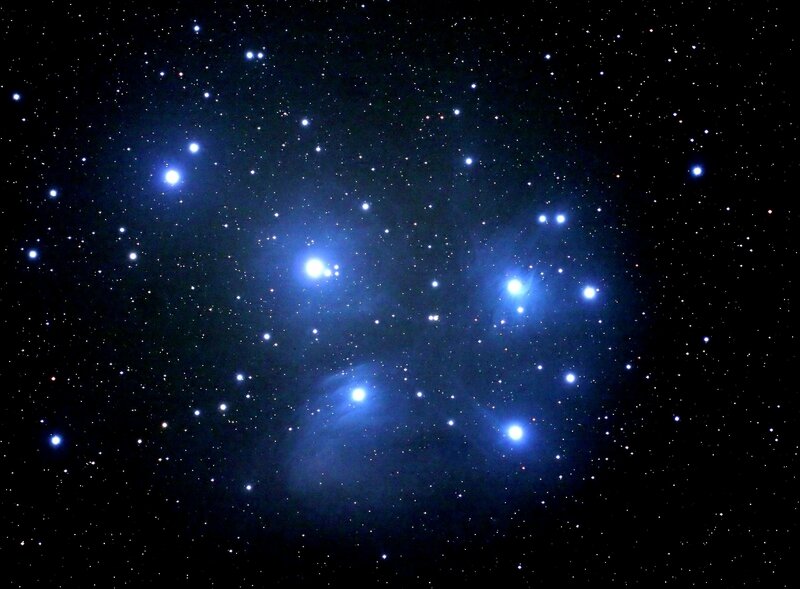 The famed Pleiades, or Seven Sisters star cluster, lies 400 light years away in the constellation Taurus. Wisps from a cloud of interstellar gas and dust through which the cluster is now passing are prominent around the brighter stars. North is up and a bit to the right. The major stars make a "Dipper" figure. Atlas (the brighter) and Pleione are in the handle to the upper left, The bowl is made of Alcyone (Eta Tauri) just to the upper right of center, then counterclockwise we see Merope (enmeshed in the complex cloud), Electra, and Maia. Up and to the right of Maia is a pair called Sterope II (the fainter) and Sterope I. Taygeta is to the right of Maia, Celaeno farther down. With no proper name, 18 Tauri floats toward the upper left edge. Filled with class B stars, the cluster is estimated to be around 130 million years old. Photo by Mark Killion. See the Pleiades, Hyades, and 16 other clusters near the Galaxy's anticenter. Return to the Cluster Page.